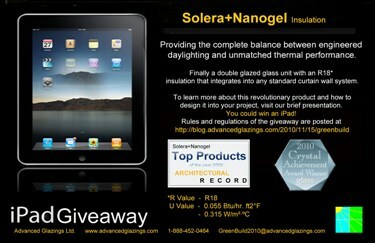 We are proud to announce that David Norris of Carpenter Norris Consulting Inc. is the winner of the Solera+Nanogel iPad contest! We are humbled by all of those who chose to help us “Push the Envelope” by sharing their innovative comments. The panel of judges had a very hard task choosing a winner. We thank everyone who helped make GreenBuild a success this year.